Branson Fishing Guide Service full time Pontoon Fishing Guide Service specializing in Large Groups and Families on Table Rock and Lake Taneycomo. Branson Fishing Guide Service we guide on Lake Taneycomo for Rainbow and Brown Trout and Table Rock Lake for Large Mouth, Small mouth and Spotted Bass, Crappie, White Bass, Pan Fish, Seasonal Spoonbill in our roomy Pontoon! Hello, my name is Don House, I’m the owner of Branson Fishing Guide Service and here is my Fishing Guide Profile. I’m a US Coast Guard licensed and insured full time fishing guide on Table Rock Lake and Taneycomo Lake for Bass, Crappie, Trout and Spoonbill. At Branson Fishing Guide Service my Fishing Guide Profile will explain my specialty is deep water fishing tactics with many types of live and artificial baits. I have accumulated over 30 plus years of fishing experience and refined the skills needed to teach you how to find and catch the fish you are looking for. 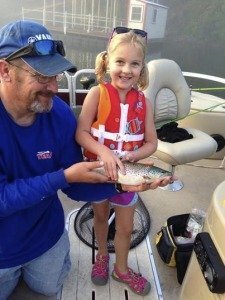 Families with kids of all ages are welcome on my boat for a fun day of fishing, learning and just an all round nice day of relaxing in the beautiful Ozark Mountains. Call and setup a trip with me! We’ll have a memorable day on the water. So now let me share with you my Fishing Guide Profile and tell a little bit about myself so you’ll know who you’ll be fishing with. I started fishing back when I was a young boy living in Kansas City fishing for crappie, bass and trout in and around the Missouri and Kansas lakes, Strip Pits and Ponds. I grew up fishing at Bennett Springs State Park for rainbow trout with flies and fly rods and of course cheese balls. That’s for you Mom and Dad. My parents felt it was better to keep their boys busy with fishing, camping and Boy Scouts – all three of us are Eagle Scouts. Little did they know they were planting a seed that would grow in me, a son that fished for a living. After attending college I spent the next 25 plus years in the computer industry designing and installing computer networks all over the US. I would take my clients fishing and fish tournaments to relax and get away from the stress and pressures of big business. After the sale of a computer company I was part owner in, I felt it was time for a change so my family and I moved from Kansas City to the Branson area to start a new life following our dream of living on Table Rock Lake and Branson Fishing Guide Service was started. I’m blessed with a beautiful family. My wife of 33 years, Julie, puts up with me and my fishing schedules and our two beautiful daughters, Abby, 31 and Katie 29 both Married and enjoying their life up in the city. Both Abby and Katie are already blessing us with grand babies. Our beautiful twin grand daughters Avery and Maci now 6 and Harper now 2 and our newest and our first grandson Jaxon! Yes all are my fishing buddies and just love the water! So hope that tells you a little bit about myself, I’m just a hard working person who believes in God, Family and enjoying life and yes I have a passion and love to work as a fishing guide! So give Branson Fishing Guide Service a call and lets give it a try! Let’s go fishing!! If Capt. Don is already booked please feel free to contact these outside supporting guides we use.